Living in Toronto has been a real blessing, even though I continue to struggle to keep my wife—a true California girl—warm throughout the winters. Together we have three boys under seven and also two Corgis, Aquinas and Athena. We're also fortunate to have found an outstanding church, Cedarview Community Church, with one of the most insightful expositors (Don Horban) of the Bible we've ever had the privilege to hear. In November 2015 I traveled to Atlanta, GA for the annual meeting of the Evangelical Philosophical Society. This year I co-presented (with Rich Davis) a paper that I worked last year when a Templeton Fellow at Ryerson University. Our paper explores whether the mechanics of Plantinga's free will defense undercut his more recent O Felix Culpa theodicy. This year I was also elected to the Executive Committee of the EPS so got to meet a bunch of new people in that role. The view from my hotel in Atlanta at the National Meeting of the 2015 Evangelical Philosophical Society. 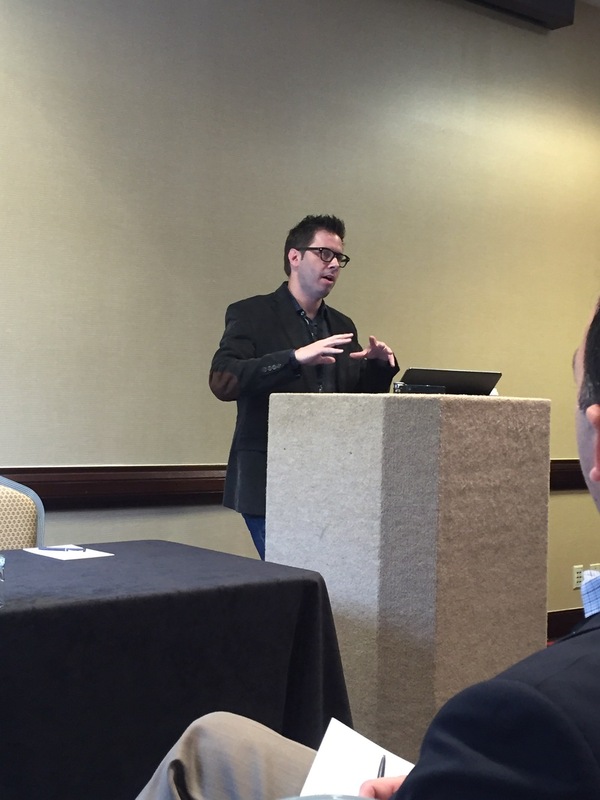 Presenting, with Richard Davis, our paper "Plantingean Pro-Theism: Transworld Depravity, Incarnation, and Atonement." Greta Turnball (Boston College) reading her fantastic paper, "Should Faith Desire Evidence? A Response from the Relationship Model." Myron Penner and Ben Arbour on "Arguments form Evil as Evidence Against the Axiology of Atheism." The annual EPS reception really is one of the highlights of the trip. It's always such a wonderful time of mutual encouragement. Sarah Geis giving a vigorous defense of Clifford in her paper, "The Ethics of Chrisitan Belief: Developing a Friendship with W.K. Clifford." Travis Dumsday (Concordia) giving a really interesting argument on "Spatial Extension as a Necessary Condition for Being a Physical Object (and why it matters for Philosophy of Religion)." Always fun to have some time with my favorite former French atheist, Guillaume Bignon. Had to grab a selfie with my friend, and Stand to Reason's newest apologist, Tim Barnett. If nothing else, it was our way of proving to our (pregnant) wives that we did indeed go to the conference. Travis Dickinson (SWBTS) giving his paper on "The Epistemology of Defeat and Doubt." Paul Gould (SWBTS) presenting "A New Value Argument for God." Tom Bogardus presenting his paper, "Science, Mystery, and God." Susan Brower-Toland presenting her paper, "I Will Survive: William Ockham on Memory and the Interim State." Professor Adams discussing Ockham and Aquinas during the Q&A of Susan's paper. Jonathan Jacobs presenting on "In Praise of Silence!" Josh Rasmussen delivering his paper, "Universalist Worlds." Matthew Benton presenting his paper, "Horrendous Evils and Evidential Value." Some guy who was invited to the conference by accident. Kevin Timpe presenting his paper, "Defeating Disability." Professor Marilyn Adams on "Getting Along with the God We've Got." In October 2015 I was invited to give a paper at the University of Texas, San Antonio as part of the 2015 Breckenridge Philosophy Symposium that was held in honor of Marilyn Adams. It was a truly great conference and I got a lot of helpful feedback on the paper I read, "Broadening Free Will Defenses." I'm very grateful to the organizer, Mike Almeida, for the invitation and was blown away by the quality of presentations. Here are a few shots of the other presenters in action.